Scientists at the Woods Hole Research Center are using Python to automate processes for use in preparing the National Biomass and Carbon Dataset. Carbon is a hot topic these days. People everywhere are increasingly aware that carbon in the form of carbon dioxide (CO2) is one of the greatest contributors to the global climate change problem. Even school-aged children now know about fossil fuels and how our excessive use of them contributes to the accumulation of greenhouse gases in the atmosphere. At the same time, researchers around the world are working to understand where carbon is being stored, how much is being stored over time, and how this information can be used to better understand the global carbon budget. But while coal-fired power plants and SUVs have become icons of carbon imbalance, we tend to overlook another leading contributor to human-induced carbon emissions: land-cover change. Modeling and prediction activities for NBCD2000 are being carried out using ecoregional zones developed by the Multi-Resolution Land Characteristics Consortium. The connection between the carbon cycle and land cover is complex. Understanding the role of land-cover change, such as the conversion of forest to pasture or prairie to pavement, is a chief objective of scientists at the Woods Hole Research Center (WHRC), an environmental science, education, and policy institution on Cape Cod in Massachusetts. The center's staff have been pursuing answers to this question for many years, employing tools such as GIS and remote sensing to aid them in determining how much carbon exists, where it is located, and why it matters. A team at WHRC has undertaken an ambitious project to quantify the amount of biomass and, in turn, the amount of carbon that blankets the 48 conterminous United States. Dr. Josef Kellndorfer, an associate scientist at WHRC, and his team are generating the National Biomass and Carbon Dataset for the year 2000 (NBCD2000). 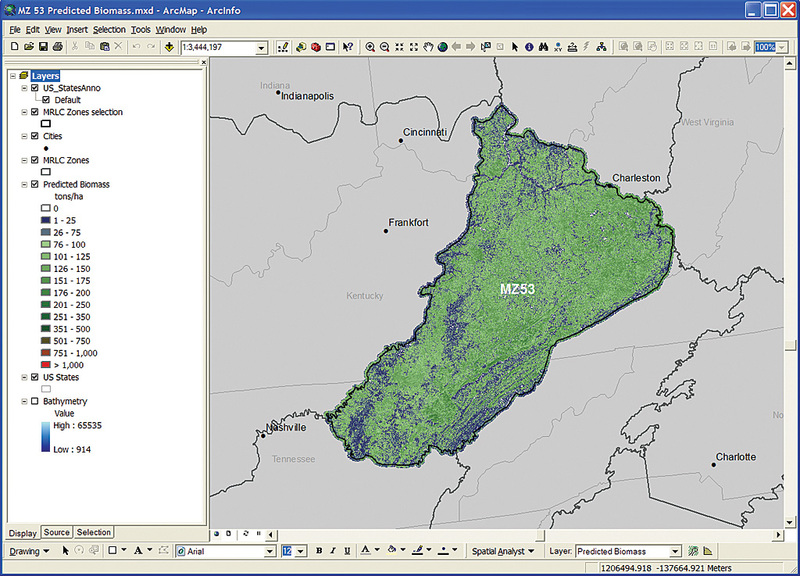 This project makes use of high-resolution (30 meter) National Aeronautics and Space Administration (NASA) satellite datasets, topographic survey data, national land-use/land-cover data, and extensive forest inventory data collected by the United States Department of Agriculture Forest Service Forest Inventory and Analysis (FIA) Program. Use of this data required that each of the dozens of GIS procedures employed in data preparation and analyses be repeated 67 or more times. Additional processing resulted from model updates, data modifications, or error fixes. Many data preparation taskssuch as reprojecting, clipping, raster-based math, and associated analyseswere conducted in the desktop environment. 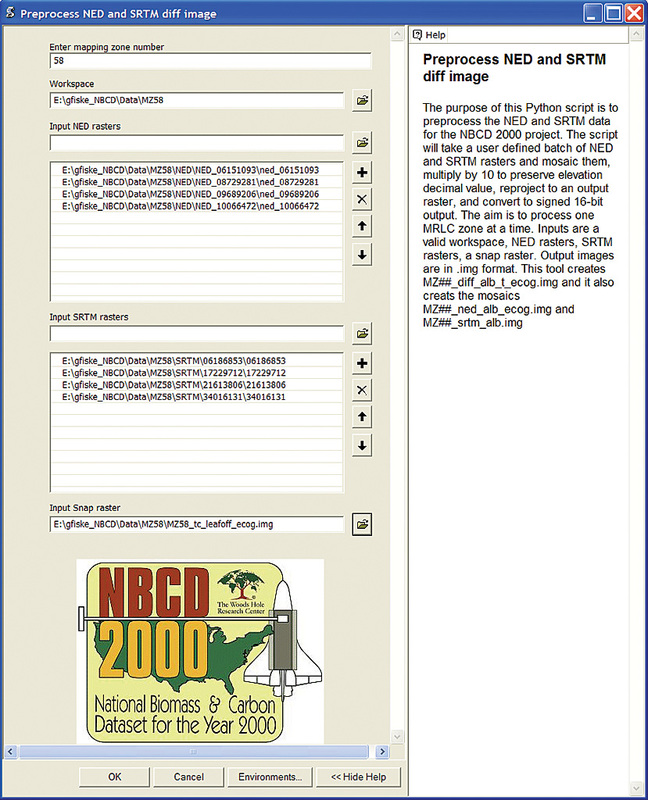 To automate these tasks in ArcGIS Desktop 9.2 (ArcInfo), the NBCD2000 team turned to Python scripting. For each task, a Python script was written and linked to a toolbox GUI in ArcToolbox. The collection of scripts was gathered into a single NBCD toolbox and shared with each WHRC team member via a local server running ArcGIS Server 9.2. Kellndorfer felt the development of an automated strategy was crucial for maintaining workflow and continuity from zone to zone because data preparation tasks were divided among the team members. New NBCD2000 project team members can quickly be productive because the tools in the NBCD toolbox have been completely documented. The actual statistical modeling of biomass is accomplished using a Linux-based high-performance computing cluster with multiple processing nodes. Both commercial and open-source image processing software was also used for a variety of analysis tasks. The team made every effort to ensure that all software packages worked together smoothly. For ease of integration in subsequent processing steps, Python scripts were written to generate files with the appropriate format and data type. The core data layers for estimating carbon are two nationwide estimates of elevation: the 2000 Shuttle Radar Topography Mission (SRTM) digital surface model and the National Elevation Dataset (NED) digital terrain model. Essentially, these datasets are "differenced" to produce an estimate of vegetation canopy height that is used in subsequent biomass prediction. The key tool in the ArcGIS NBCD toolbox generates this difference layer for each mapping zone. The necessary SRTM and NED tiles, acquired from the United States Geological Survey (USGS) seamless server (seamless.usgs.gov), are mosaicked. The NED surface is subtracted from the SRTM surface using raster math. In the final operation, the raster is clipped to the mapping zone boundary and converted to the proper bit depth required by the statistical modeling routine. 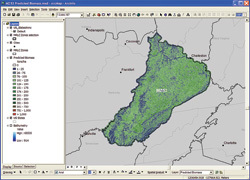 The tool performs a series of multistep, often time-consuming, GIS tasks within minutes. Previously, these tasks could require nearly an hour of setup time but now they are fully automated. Automating these tasks using Python scripting has greatly increased processing efficiency and saved hundreds of hours. Because help for the toolbox GUIs has been completely documented, new NBCD2000 team members can quickly become familiar with each tool and perform data processing with greater ease and confidence. 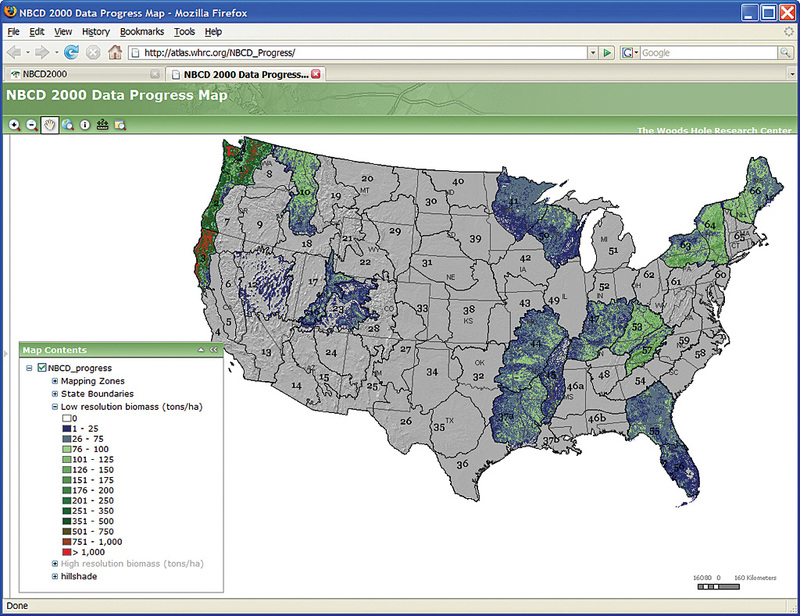 Using an ArcGIS Server 9.2 map service, completed height and biomass data has been posted on the WHRC Web site. The NBCD2000 dataset will be an invaluable information source for carbon stock assessment and flux modeling in the United States. Once completed for the conterminous United States, it will provide a baseline for comparing data products from the next generation of advanced earth-observing remote-sensing platforms. Funded by NASA's Terrestrial Ecology Program with support from the USGS Landfire Initiative, the NBCD2000 project directly supports the North American Carbon Program, a major component of the U.S. Climate Change Research Program. Clearly, a dataset of this scale could not be generated without a sizable team effort and the great benefits in efficiency, accuracy, and scalability afforded by the range of automated tools available through the desktop GIS environment. Two instructor-led courses, Introduction to Geoprocessing Scripts Using Python and Writing Advanced Geoprocessing Scripts Using Python, are available. Visit www.esri.com/training for more information. Currently, height and biomass mapping has been completed for approximately 20 zones. This data has been posted on the WHRC Web site. 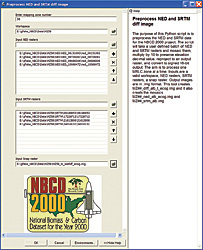 An ArcGIS Server 9.2 map service has been set up on the NBCD2000 project Web site. This interactive Web map will be updated regularly as data from the remaining zones becomes available. For more information about the NBCD2000 project, contact the NBCD2000 team at nbcd2000@whrc.org or visit the project Web site (whrc.org/nbcd). Gregory J. Fiske, a research associate with WHRC, is a geographer and an aspiring Python programmer.